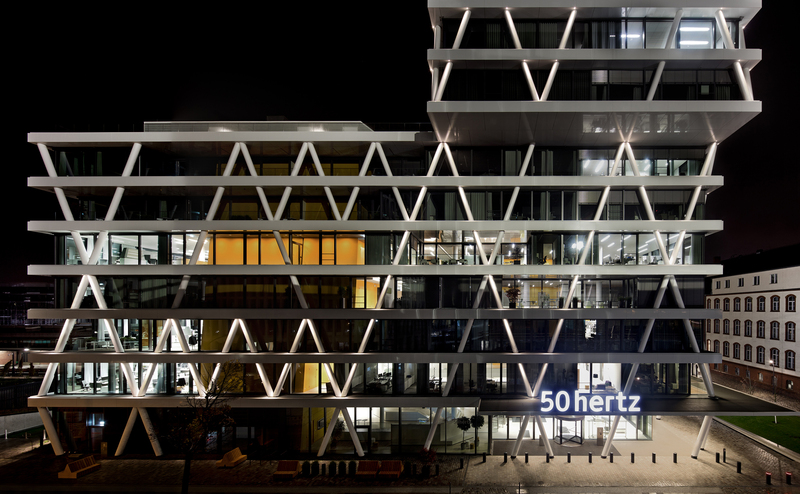 The architectural spotlights by Ewo illuminate individual columns of the 50Hertz Network District in Berlin, visualizing in a sine curve the frequenz of electricity. 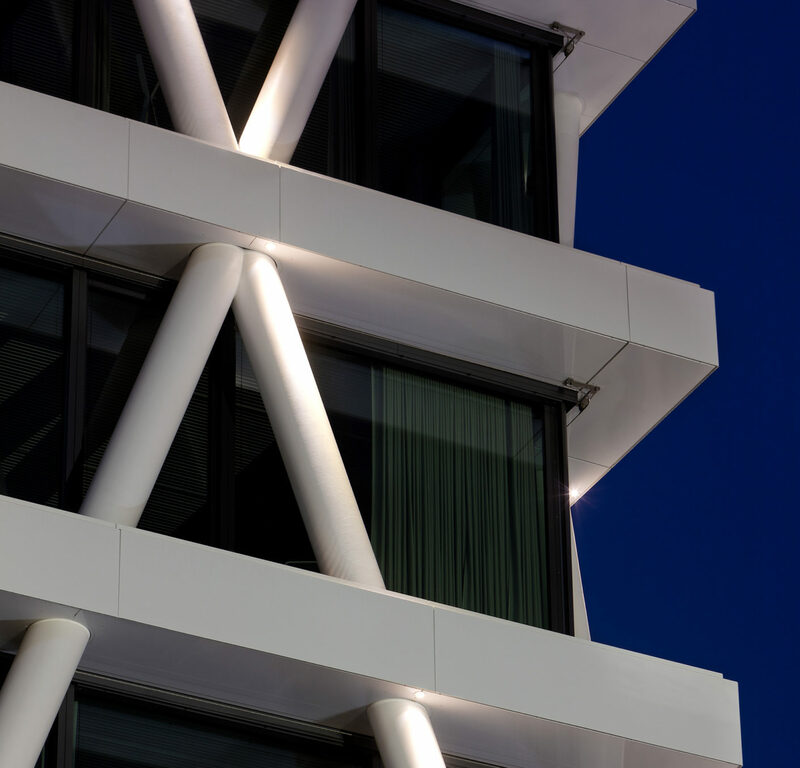 Spotlights merge into jagged light: as soon as it grows dark in Berlin’s Europacity district hundreds of spotlights by ewo illuminate the new company headquarters of 50Hertz Transmission GmbH. In simulating an alternating current curve on the office facade it visualises the work of the network operator, who is responsible for the smooth transmission of electricity to Hamburg Berlin and Hamburg, Berlin and Eastern Germany. Flush-mounted into the underside of the support coverings the energy-saving LED units are barely visible. Ewo is a firm from Northern Italy renowned for high-quality lighting systems in the public domain. With its facade illumination the family run business has decisively influenced the appearance of the 56-meter tall building close to the city’s main station. Designed by Graz-based office LOVE architecture and urbanism the slender, transparent structure with 13 storeys has space for 650 employees. 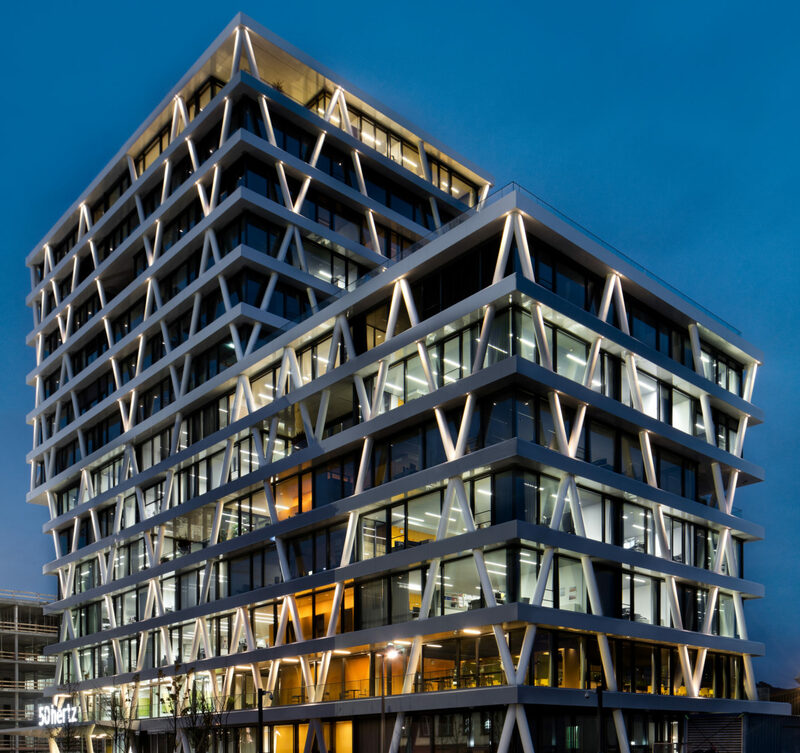 Only recently it received a DGNB Diamond certificate from the German Sustainable Building Council for the quality of its design and building culture. The facade lighting by Ewo lends the transparent building in Europacity a highly-varied, light-hearted facade structure.